Hosting a bake sale? Cut out our sign and use it to spread the word! 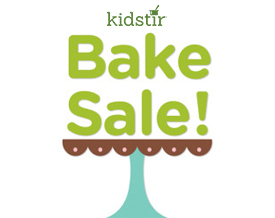 Learn to bake like a pro with a three-month subscription to Kidstir kits. Each month you’ll get lots of great cooking and baking ideas. You’ll even get instructions and tools to create the yummiest cookies and truffles. Sweet! You’ll definitely want cookies in that bake sale – so start with our “Cookie Baking Fun for Kids” article to be sure your kids are ready so there are plenty of cookies for your table. There is no doubt that more baking happens during the holidays – so here are some Kidstir Holiday Baking Tips. While in the holiday spirit, check the Winter Wonderland Cookies Kit.